Here’s a hot tip for you seafoodies out there: If you love yourself some Long John Silver’s, get down to the closest franchise now because there is a promotion you’re going to absolutely flip for. Starting this week, the quick-service seafood chain will award a lifetime supply of free popcorn shrimp to whoever brings them the head of the sea serpent that killed its CEO. Wow, this is a dream come true for Long John Silver’s fans. The rules are simple: Anybody who can track down the sea serpent that consumed top exec Paul Bradford last month is invited to kill it and bring the head into a participating restaurant to claim their endless bounty of popcorn shrimp. The contest runs indefinitely, as the leviathan can live for thousands of years, but you’ll want to be quick. There are bound to be a lot of hunters out there taking to the high seas in the hopes of getting all the bite-sized, batter-fried shrimp one can handle. Oh man, if you want to take advantage of this deal, you better get out your nautical charts and start searching for that serpent. Nice! We’d love to tell you exactly where to find the monster, but the only survivor of the attack has gone mad, and just whispers, “When the winds all die and the sea turns gray, it’s too late to run, you must join the fray,” over and over to himself. But that should be enough for shrimp lovers to set a course in their quest to decapitate the murderous sea serpent—just make sure your crew doesn’t mutiny in an attempt to get the lifetime popcorn shrimp for themselves! Amazing! 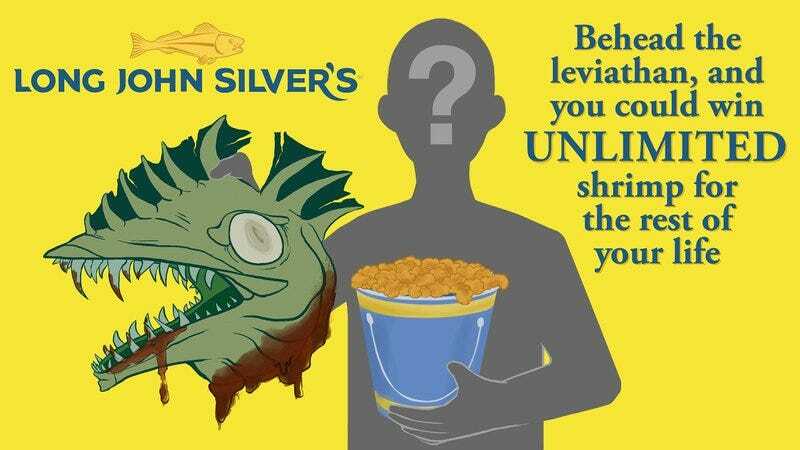 You’d have to be out of your mind to miss this incredible opportunity to test yourself against a sea monster in exchange for unlimited popcorn shrimp. Thanks for opening up the hunt, Long John Silver’s!